When is a Cone 6 a Cone 6? Have you ever wondered what a perfectly fired mature cone 6 looks like? Simplifying the Orton Temperature Chart The Orton Cone Chart is made up of several different columns of information. Which one do I use for my kiln? Using a Cone Template Cone Templates allow you to attach a number (bending angle) to your fired cone so it is easy to compare one firing to the next without saving all your old cones. Why Use Self Supporting Cones? Have you ever wondered why you might want to use Self-Supporting Cones instead of Large cones? Mounting and Bending Angle is built in to self-supporting cones. All you need to do is set them on a flat surface. How to properly mount Pyrometric Cones in a Plaque Mounting cones properly is important to yield results that match Orton's temperature charts. The video shows a few easy pointers to make sure you are mounting your cones properly. 3 Hole and 4 Hole Cone Plaques Plaques are available in 2 sizes. This video also shows how to make a 4 hole plaque into a 2-2 hole plaque if needed. How Do I Separate my Large Pyrometric Cones? Large cones are shipped in "Compacts (2 Connected Cones). This video shows how Orton recommends separating large cones before mounting in plaques. How Do I Separate Small Cones? This video shows what a pair of small cones looks like and how to separate them. Tell Me About Orton Iron Free Cones Cones containing Iron oxide make them "Brick Red in color. Most of Orton's Cone Series are made without Iron Oxide. For customers who cannot tolerate iron oxide in their firings, Orton produces an alternate series to the "red cones (between cone 010 and cone 3) called the "Iron-Free series. What Cones are Used in High Temperature Industrial Applications? Orton manufactures cones starting at cone 022 and ranging up to cone 42. For high temperature applications, Orton makes self-supporting cones up to cone 28, Large and PCE cones up to cone 42. PCE cones have been pre-fired to burn out any organics that are used during the cone forming process to prevent outgassing. What Cones Are Used by Ceramic Artisits? Ceramic Artists, Potters and Contemporary Studios typically use cones between 022 and 10. This video gives a general explanation of the different ranges of cones and their applications. What are the differences in the 4 different Cone Shapes? Orton manufactures pyrometric cones in 4 different shapes. This video is helpful to see the different cones that are available. Large and Self-supporting cones are "Witness Cones. They are placed in the ware setting to "Witness what your ceramic ware is being exposed to. Small cones and Bars are typically used in a Kilnsitter shut off device. Some laboratories also use small or PCE (Pyrometric Cone Equivalent) cones as witness cones where space is limited. Pyrometric Cones Bending Have you ever wanted to see cones bend? This time lapse video allows you to see the guide cone bending first, with the firing cone coming down next. The guard cone does not move but available if the Firing cone shows an "over fire condition. If the cones are correctly mounted and respond in the expected manner, it is necessary to use some standard procedure for interpreting the degree of deformation as the tip deforms along the arc of a half circle. Common practice has been to refer the tip position to hour positions on a clock face; that is, 2 o'clock, 4 o'clock, etc. See Figure 1. This is a fairly satisfactory way of estimating deformation except that it introduces the factor of human judgment. However, it is about the only satisfactory way of making the estimate in a dynamic condition where the cone is continuously bending. When cones are being used to study heat effects after the process has been completed, angular position of the cone tip is a more reliable measurement of deformation. Engineers at the Orton Foundation have developed simple devices for doing this which give a more accurate measurement than estimating clock position. Use of such a device is shown in Figure 2. Fig. 2 “ More accurate measurement of cone deformation is achieved by the use of a template. Users of cones should realize that a unit of clock position does not necessarily represent a constant increment of temperature, even with a uniform heating rate. Cones tend to deform more rapidly as the extent of deformation increases. The effect is partially the result of the liquid glassy phase becoming less viscous (more fluid) and the mechanics involved in the bending cone. This is illustrated in Figure 3. With this particular cone, heated at the rate of 108°F per hour, one clock position deformation from 1 to 2 o'clock required a temperature increase of 5°C. As the deformation reached the end point, going from 5 to 6 o'clock only 1°C was required to effect the change of one clock position deformation. The approximate precision of Pyrometric cones in terms of temperature can be shown by combining the results of the frequency distribution curve with the data in Figure 3 for both Large and Self-Supporting cones. This is shown in Figure 4. Fig.4 “ Approximate "end-point precision for Self- Supporting Cones and plastic formed cones. Using charts provided by Orton, equivalent temperatures can be determined from the final bending position of the Pyrometric Cone. Orton Self-Supporting Cones duplicate their bending behavior with a standard deviation of 2.4 angular degrees or less than ± 2°C. And only Orton cones are traceable to Standards established in 1956 by H.P. Beerman at the National Bureau of Standards (Journal of American Ceramic Society, Vol. 39 1956), Cones from other manufacturers tested by Orton have been shown to have variations as much as 10 times larger. Orton Pyrometric Cones are dry pressed instead of plastic formed, providing less variability in performance, higher green strength and fewer mounting problems. 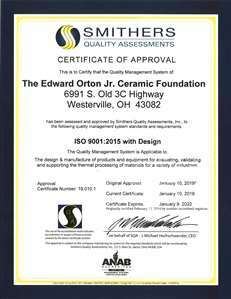 All cone batches made by Orton are tested to match established standards. Materials are mixed, sampled and test cones made and fired on defined heating rates with Standard Cones. Small adjustments in the batch composition are made, as necessary, until bending performance matches the Standard Cones. This assures accurate, reproducible and traceable behavior for all Pyrometric Cones made by Orton. Orton recommends using a template to measure the bending angle of the cone after firing, which is easy to read to within 5 angular degrees. Bending angle can be converted into a temperature using a table provided by Orton. For heating rates other than 60°C/hour, a graph is used to determine a temperature correction. 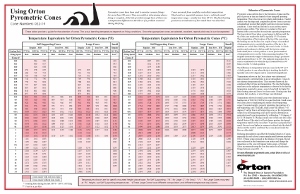 These Charts are available for all cone numbers sold by Orton and are provided to customers free of charge with a template. More durable plastic templates are available for sale. Using Self- Supporting Cones and Equivalent Temperature Charts from Orton, temperature differences can be determined within the accuracy of thermocouples or infrared pyrometers. Temperature Equivalent Calculation Sheets for Orton Pyrometric cone numbers are found in the Reference Library. During the firing process, time, temperature and kiln atmosphere can influence the maturing of pyrometric cones, the same as any ceramic body. Heating rate will greatly affect the temperature at which a cone starts to deform, the rate of bending, and the end point (cone equivalent temperature) of the cone. Typically, the faster the product or cone is heated, the higher the temperature required to mature the product or bend the cone by the same amount. This relationship can be seen in the cone temperature equivalent tables in the Cone Reference Chart. Note that the temperature for the end point of cones increases as the heating rate increases. The maturing of most ceramics occurs during the last 100°C of the firing process. This is also true for the bending behavior of a pyrometric cone. Since cones are time-temperature (heat work) indicators, then the heating rate will affect the end point (when the tip reaches a 90° angle) of the cone. Since most firing profiles incorporate a hold time, the actual or effective heating rate must account for this variable. As a rule of thumb, one can calculate the effective heating rate by determining the total time the ware is subjected to the last 100°C in temperature. As an example, assume that the kiln was heated to a top temperature of 1200°C and it took the kiln 2.5 hours to go from 1100°C to 1200°C. If the kiln was held at 1200°C for 1 hour and then cooled from 1200°C to 1100°C in 0.5 hours, then the total time for the top 100°C would be 4 hours. The effective heating rate is estimated by dividing 100°C by 4 or 25°C per hour. Orton provides temperature conversion tables and charts that allow the bending angle to be converted to an equivalent temperature, if the heating rate is known. This allows for determination of temperature differences within a kiln or a kiln car. Hold time also affects the bending or deformation of Pyrometric cones. Generally, firing to an equivalent temperature for a cone and then soaking for about 1-2 hours will be sufficient heat work to deform the next higher cone number. Additional soaking of 4-6 hours will deform the following cone, and some 16-20 additional hours will be required to deform the next higher cone in the series. Reducing atmospheres can have an adverse effect on the deformation behavior of cones. The low temperature cones, containing glass frit with metal compounds, are especially sensitive to reducing conditions. Also, under reducing conditions, the organic binder cannot be fully oxidized and as a result, these cones may bloat and turn black (see Trouble Shooting section for descriptions of cone problems). Bloating will alter cone deformation characteristics. The "red cones (those containing iron oxide-cones O10 to 3) are also adversely influenced by reducing conditions and will have a green to black appearance after firing. All cones that do not contain lead or iron oxide (cones O19 through O11, "Iron Free O10 through 3, and cones 4 through 42) can be used satisfactorily in reducing atmospheres provided the organic materials normally present in cones are fully oxidized (burned off) before resorting to a reducing atmosphere. Heating cones to 800-850°F in air will burn off the organic binders. PCE Cones or cones which are pre-calcined have been successfully employed where the entire firing is under neutral or reducing atmospheres. Cones and most ceramics will generally mature sooner, or at a lower temperature, when fired in a reducing atmosphere as compared with oxidizing conditions. Pre-calcining cones may alter deformation characteristics if they are heated into a region where glass begins to form, so users requiring such treatment should establish their own procedures and controls through testing. The practice of "flashing a kiln (alternate oxidizing and reducing atmospheres) does not normally have an adverse effect on cone deformation. Kiln atmospheres which are either sulphurous or reducing may cause some cones to develop a rigid "shell with an interior that becomes fluid, therefore, producing erratic deformation. This shell occurs due to a change in the chemical composition of the cone surface. Improved Iron-Free Cones, O4 through 3 (available since 1976) and all cones hotter than cone 3 may be used satisfactorily in a sulphurous atmosphere. "Hard shelling may also be encountered with regular cones O10 through O3 in a high velocity or prolonged firing in a combustion atmosphere. This type of "hard shelling is caused by volatilization of boric oxide from one of the raw materials, glass frit, in the presence of high moisture air. "Hard shelling causes cones to deform at higher than normal temperatures. Severely "hard shelled cones do not bend in an arc but fall over stiffly like a fallen tree. They have a dry matte surface and sharp edges. The improved Iron-Free Cones, O10 through 3 (available since 1976) are free of boric oxide containing frit and thus do not "hard shell from this cause. The presence of water vapor, particularly in large quantities, will also influence cone behavior. In fact, even in small amounts, it can cause a cone to deform sooner than normal. The reason for this is that water vapor diffuses into ceramic materials during firing and causes changes in the vitrification process¹. This is the main reason that cones exhibit a different behavior in electric and non-muffled gas kilns. Even though water vapor in the products of combustion can run as high as 19%, it does not necessarily detract from the usefulness of cones because comparable behavior usually occurs in the properties of the ware. Fly ash from solid fuel may settle on the cone and to some extent influence its deformation. Likewise, volatile products such as salt fumes, lead, and zinc compounds may produce a surface glaze on the cone, which may or may not influence behavior. The cutting action of flames can cause cones to develop melted tips or behave in other cause abnormal ways. If possible, cones should be protected from flame impingement and kiln drafts. Radiation from hotter surfaces, or, if the cones are placed close to cooler surfaces, may also affect cone deformation, and, so far as is practical, cones should be protected from this condition as should the ware. Most standard Orton cones do not contain iron oxide (LRB and SSB). Only 14 of the Standard Orton Cones (LRB and SSB) between 010 and 3, contain iron oxide. For applications that cannot tolerate "Iron Oxide", Orton developed an "Iron-Free" Series. The designation for "Large" Iron Free cones in this range is IFB instead of LRB. The designation for "Self-Supporting" Iron Free cones in this range is "SSK" instead of SSB. The temperature equivalents are slightly different for the two series. Therefore you should use all "standard series" or all "iron free series" between cone 010 and cone 3. Over the years, Orton has been asked how the Orton temperature equivalents compare to other pyrometric cones. The attached table compares Orton's temperature equivalents to cones that were made in Brazil, England, India, Japan and Germany. Orton ships cones worlwide and have manufactured Standard Cones continuously for 118 Years. Some of the cones listed in the table are no longer manufactured. KPM (KÃ¶nigliche Porzellan-Manufaktur) in Germany stopped producing Seger Cones on December 31, 2001. Reimbold and Strick (member of the Torrecid Group) was the primary distributor of all German Seger cones throughout the world. Reimbold & Strick has been providing Orton pyrometric cones to their customers since 2001.